Does it go off when you push the plunger in behind the brake pedal? It might just need to be pushed towards the pedal more... Could also check the grounds behind the plastics in the trunk. Its gotta be something in the wiring harness or that switch... Does the wiring looked all jacked up like they messed with it? They could have put stock tail lights back in and just did a hack job. I have that wiring harness laying around if you need a picture of what It should look like. Could be a stuck relay. Are those your brake lights or driving lamps?? 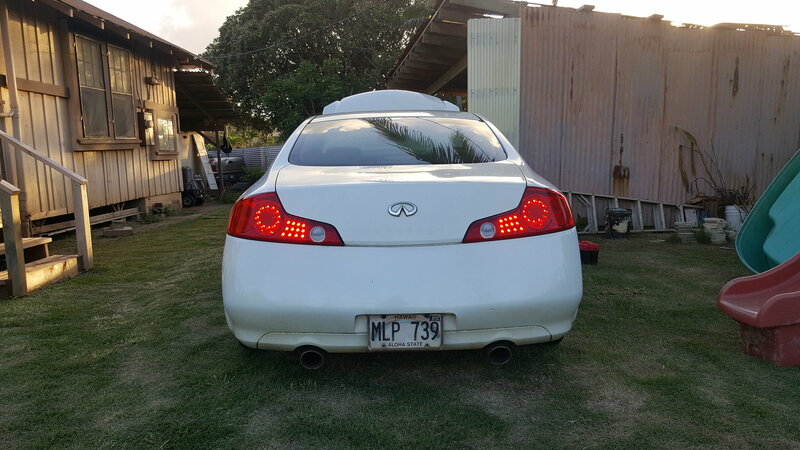 Because they don't look like your brake lights..
Hey G35808 , did you ever figure this issue out? I'm having the same problem. I thought it was the switch and bought a new one but all three of the brake lights are still on. Any guidance would be appreciated!